Steve the Sheriff: The Case of the Missing Thing is rated 4.0 out of 5 by 21. Rated 5 out of 5 by loopyerme from Have fun & relax I downloaded the game so I could have a game to go to to just relax and have fun. It fit the bill perfectly. I had fun and was challenged just enough to make it interesting without it being nail-biting. The storyline was cute. I had a blast reading it in different voices to match each character. I put the first game on my wish list. If you want to relax and play without too much difficulty, I highly recommend this game. Have Fun. 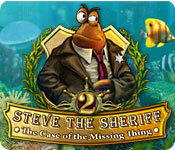 Rated 5 out of 5 by upsysydaisy from Steve Is No Ordinary Sheriff, Just A Little Fishy! This game was lots of fun and so dang cute! I bought it thinking a break from my normal brain-taxing ones would be a good thing. Something to just relax and have a jolly good time with. It was certainly entertaining. The missing thing was unique for sure and hunting for it was an exercise in silliness. I loved it all ! The HOs, much to my surprise, were quite difficult, so that tweeked my relaxing a bit (lol). The scenes were "overflowing" with items and most of them were very small, all very well hidden with few exceptions. I even resorted to my magnifying glass at times. But if a HOG is not challenging, it spoils my fun and there is no point to even playing. The HOs and lists were different than the usual and at the beginning of each scene a cluster of bubbles would appear and when you click on it Steve is there with your first task. The bubbles sometimes appear twice in a scene. Also, remember to find the cigar in each scene, there are 36 total. If you miss any you can backtrack to collect them. There are no game modes and no penalty for clicking to your heart's content on anything and everything. Loved the clever mini games. My two faves were trapping the culprit in the cage and finding the right colored potion to uncover the painted-over hidden masterpiece. Great little game that I really think you will enjoy, whatever your age. The length is just right. NOTE: If you experience a slight delay in your found items leaving the scene after you click on them, no need to worry. My computer or the game? Don't know, but it was no problem for me. Clicking on them again doesn't seem to cause complications either, if you feel antsy about it. God bless! Rated 5 out of 5 by fredandethel from Great improvement on Steve the Sheriff 1 The first Steve the Sheriff had far too many spot the difference minigames for me - didn't even finish the trial, but the second in the series is just really nice to look at and great fun. Never seen such long lists of objects to find, but most are fairly easy to find, just a few gave me a bit more challenge or needed a hint. I really like the investigation bits - bubbles containing objects to find appearing round Steve's head. Looking forward to Steve the Sheriff 3 if it's like this! 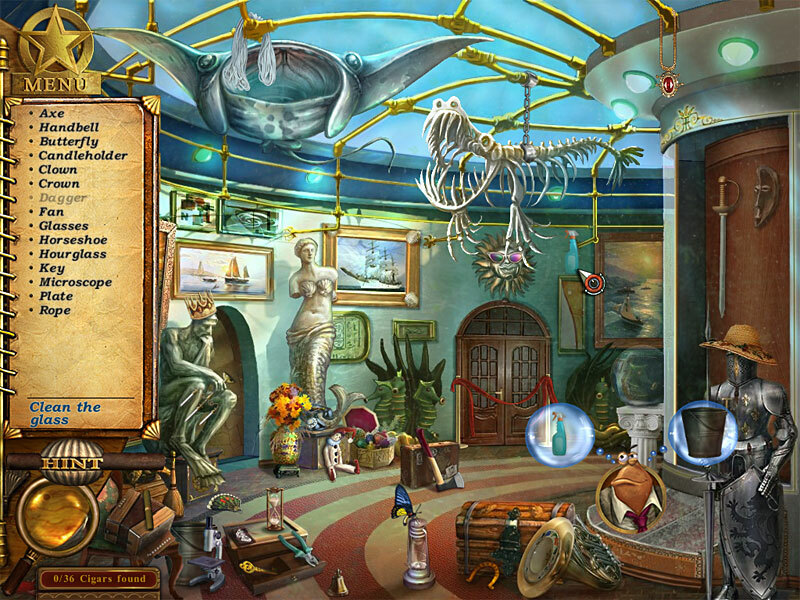 Rated 5 out of 5 by Gameritis50 from Neptuneville needs help one more time If the game play does not put you in the mood, the ambiance will. 10 out of 10. Some things are tiny to look for, and pay attention to the bubbles..Have a great time, and do not forget the cigars. Rated 5 out of 5 by batikati from Bright and easy to see. I am a grandmother who enjoys playing HO games, so they cannot be too dark, and I don't like them at all gloomy! This game is a good one! I am playing it through for the second time now, and liking it as much as I did the first time! 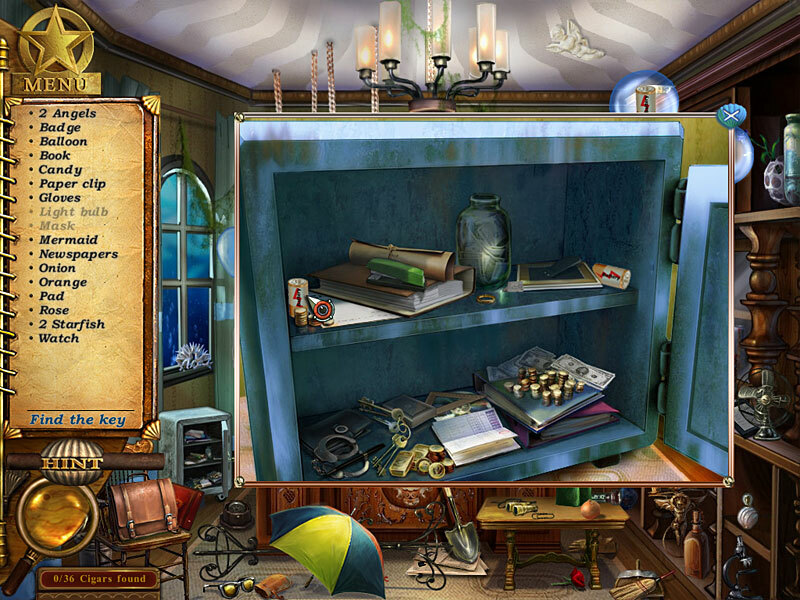 It has lots of objects, and most of them are fairly easy to find, but it is still a challenge. On a couple of the scenes, there is a lot of clutter (at the junk yard for example) and you do have to really look and concentrate! But the Sheriff enjoys having pie with his wife and son while they ask him questions about the case. If the objects are fairly easy to see, and not all broken up in pieces... which that is the case once or twice, but they are easy to find, I am happy and having a good time. I think most of you will enjoy this game. Try the trial, and find out what you think! Good luck! Rated 5 out of 5 by mygames49 from relaxing i loved this game. no backtracking, yessss, very easy going, the story is a good one, it was just so cute and sooooo relaxing. i tried the first one, it was ok. nothing like the second one. everybody must play this game. Rated 5 out of 5 by MyMay from Fun and relaxing A nice alternative to the mind bending puzzle games. My grandchildren and I enjoy playing this easy paced search and puzzle game. Rated 5 out of 5 by katyggls79 from Nice, Easy, Relaxing HOG This is a great game, especially if you're looking for something easy going and light hearted. The graphics are really cute and the story funny. The puzzles and HO scenes are on the easy side. This would be a great game to play with kids, but even I enjoyed it and I usually favor the darker, slightly more difficult games. 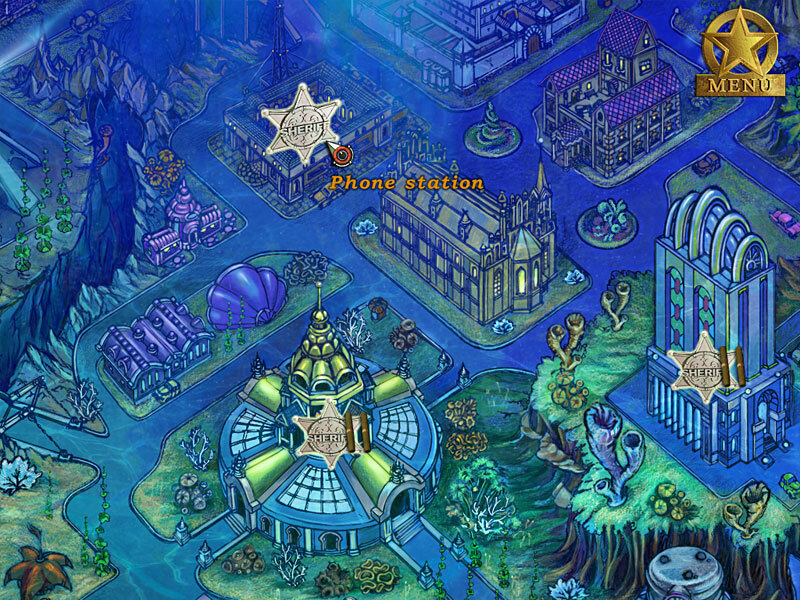 Join Steve the Sheriff in an all new Hidden Object Adventure crime saga set in the zany town of Neptuneville.